On 30th October 1974 Swansea businessman and boxing promoter the late Eddie Richards, brought to his hometown a live showing of one of the greatest World Heavyweight contests in the history of professional boxing! He had astutely negotiated a deal with London entrepreneur Jarvis Astaire to have the ‘Rumble in the Jungle’ relayed direct by satellite to the Odeon Cinema in Kingsway, Swansea courtesy of Viewsport. .At around 2.30am hundreds of boxing fans poured into the city centre on their way to the Odeon Cinema in the Kingsway. They were about to witness live pictures of the 'Rumble in the Jungle' scheduled to commence at 4.00am direct from Kinshasa in Zaire. Admission to the Odeon was £20 with fight fans anticipating a momentous event - they were not going to be mistaken! Before this historic fight they could not have imagined how it would run its course, or how exciting, dramatic or sensational it would turn out! With men and women of all ages taking their seats, Eddie knew well before fight time that he was serving up something very special! 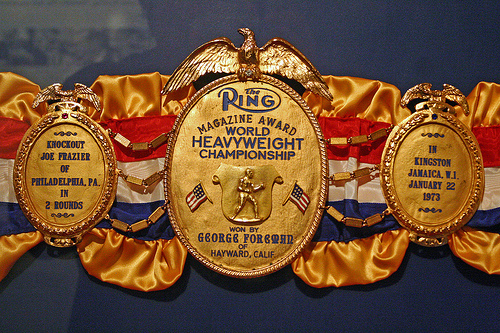 The 'Rumble in the Jungle' was a World Heavyweight championship contest and a Don King promotion. It featured the 24-year-old George Foreman from Houston, Texas who was the undefeated World Heavyweight Champion. He had won all his 40 bouts with 37 inside the distance since turning professional after winning the 1968 Olympic Heavyweight gold medal in Mexico City. Foreman who had weighed in at 220lbs, was making the third defence of the title he had won from Joe Frazier in Kingston Jamaica on 22nd January 1973. First into the ring was the challenger 32-year-old former World Heavyweight champion and 1960 Olympic Light Heavyweight gold medallist Muhammad Ali who looked in great shape at 216lbs. Ali had won the World Heavyweight title on 25th February 1964 in Miami Beach, Florida when defending champion Sonny Liston retired on his stool at the end of the sixth round. He made eight successful defences before being stripped of his title and suspended from boxing in April 1967 for refusing to enlist into the US Army. At that time Ali was undefeated in 28 contests, but he wasn’t allowed to return to the ring again until October 1970 some three and a half years later. 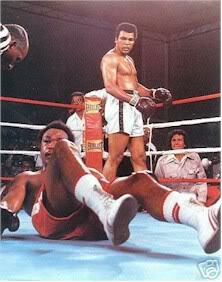 This would be Ali’s 47th paid bout having won 44 and lost just two decisions to Joe Frazier and Ken Norton, both ominously knocked out in two rounds apiece by Foreman. The audience at the Odeon, along with the thousands in the May Stadium Kinshasa, waited patiently for the late arrival at ringside of champion Foreman. Ali used the time to stir up the crowd by conducting a chant of “Ali boom aye” which translated meant “Ali kill him.” Ali had spent a lot of his time in Kinshasa winning the locals over and his endeavours seemed to have paid off with the vast majority of the crowd appearing to be Ali supporters. Perhaps it was not quite the same at the Odeon where the support was fairly evenly shared, there were still many who wanted and expected Foreman to shut up Ali’s mouth once and for all. The challenger seemed quite relaxed playing the waiting game in the ring keeping loose with some fast shadow boxing. As the champion entered the ring you could sense the tension among the Swansea fight fraternity, Foreman looked mean and in tip-top condition as he discarded his red robe. Ali seemed unnerved and nothing like the hysterics of 10 years previous when he was challenging Sonny Liston for the title. After the preliminaries were over, referee Zack Clayton called both fighters to the centre of the ring. Both gladiators glared at each other and this was the moment when all the talking would stop - or so you might have thought. Ali was still jabbering away taunting the champion and encouraging the crowd to continue with their chanting. As the bell rang for the start of the first round Ali darted across the ring determined to take the fight to the champion much to Foreman’s surprise. The challenger was catching Foreman with straight right hand leads a pretty risky tactic for an orthodox boxer in the early rounds of a fight particularly against a big puncher like Foreman. After surprising the champion and the audience in the Odeon with his aggressive tactics in the first round Ali confounded everyone, even his own corner men Angelo Dundee, Ferdy Pacheco and Bundini Brown from round two onwards, when he just lay back on the ropes inviting Foreman to attack. 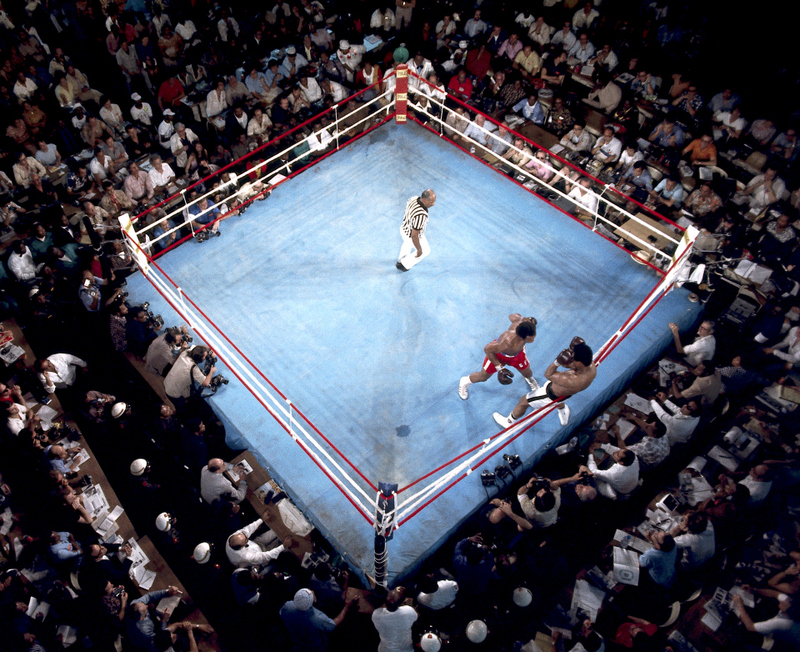 By the end of round five the fight was following a clear pattern with Ali employing his 'rope a dope' tactic. He knew he wasn’t going to be able to dance and move for anytime up to 15 rounds. He was allowing the champion to punch himself out and, in the last 30 seconds or so of each round, opened up with a fusillade of lefts and rights to Foreman’s head whose face, was by now quite puffy and evidence of the success of Ali’s strategy. Even the champion’s continuous assault on his challenger’s body seemed to have little effect and it was clear to most at the Odeon that Ali was in control of the bout. Dare they think that he may replicate his feat of 10 years previous and achieve yet another great upset in the history of the Heavyweight Boxing Championship of the World? The Odeon audience were beginning to realise there may be a shock in store! The pace of the fight was slowing drastically by round six as Foreman continued to lumber forward in what now seemed to be a forlorn hope of detonating one of his bombs on Ali’s jaw. There seemed to be very little explosive left in those wild swinging punches. Ali’s corner men were screaming for him to get off the ropes and clearly unaware of his tactics, Ali seemed quite happy with the way the fight was going. 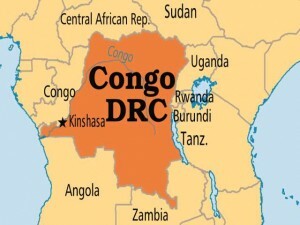 As round six came to an end Foreman was staggered by a straight right that brought loud cheers from what had become a wildly partisan crowd in Zaire. Ali did not sit down at the end of the round, he spent almost the entire minute whipping up the crowd into a frenzy “Ali boom aye!” they chanted. In the Odeon the audience were slightly more subdued but were beginning to realise there may be a big shock in store. The seventh begins and now Ali is using his superior strength to pull the weakened Foreman around the ring, smothering all of Foreman’s futile attempts to pull out a big shot that may change the course of this fight. Ali persists in ridiculing the champion continuously insulting him as they huddle together in the clinches. Again toward the end of the round the challenger opens up with another barrage of blows and George is again in trouble, spectators in the Odeon are already speculating that this amazing contest may shortly come to an abrupt end. Ali although tired himself seems to be able to call on reserves of energy while the crumbling champion appears to have no energy and has lost the power in what we knew to be his brain numbing punches that had relieved great warriors like Frazier and Norton of their senses. It seemed that big George had nothing left in his armoury to turn the tide, while Ali returns to his corner and like his following he sensed that victory was not very far away. Series of right crosses, the fourth of which sends the champion to the canvas for the first time in his career! Ali clips the champion with a left and right to the head at the beginning of the eighth round. The champion responds throwing a wild right, which misses by a country mile, the momentum of the punch very nearly, saw Foreman hurtle out of the ring. George launches another attack realising that his opponent is dictating the course of this fight, the challenger backs up content to allow his assailant to punch himself out. As the round draws to an end Muhammad shakes the champion up with a series of right crosses the fourth of which sends the champion to the canvas for the first time in his career. Zack Clayton picks up the count and as the disorientated Foreman rises to his feet the referee waves his arms signifying that he has completed the count of ten. Once again the amazing Ali has defied all the odds and in the process has become only the second boxer in the history of the championship to regain the World heavyweight title. Embark on a remarkable second reign! The new World Heavyweight champion was about to embark on a remarkable second reign defending his title ten times before losing to Leon Spinks in February 1978 on points over 15 rounds, a decision he reversed six months later and then relinquished the title. Ali challenged the new champion Larry Holmes on 2nd October 1980 approaching his 39th birthday but was retired by his corner at the end of round 10. Muhammad finally retired after losing a 10 round decision against Trevor Berbick in Nassau Bahamas on 11th November 1981 a month before his fortieth birthday. Ali who was the only boxer to have won the World heavyweight title three times, had lost five times in 61 contests, three of those defeats came in his last four fights. There was an atmosphere of shock and awe in the Odeon Cinema - the nocturnal audience trying to digest in their sleepy minds what their eyes had just witnessed. As they left their seats to vacate the theatre and exit into the darkness of the Kingsway, those that had witnessed Don King’s “Rumble in the Jungle” felt that they had been spectators of a very special event. Promoter Eddie Richards who, because of the high overheads, made very little money on the venture was pleased that he was the host of a very memorable and historic event.